If you’ve been searching for a new car that can offer you a wide variety of qualities at an affordable price, the midsize sedan segment of the auto industry will be your best option. The segment is an extremely popular choice with drivers who are looking for a vehicle that has it all at an affordable price. Two of the top contenders in the midsize sedan segment continue to be the Nissan Altima and Toyota Camry. Which model is the best choice for you? This side-by-side comparison of the 2019 Nissan Altima vs 2019 Toyota Camry will help you determine which midsize sedan has what you’re looking for in a new car. 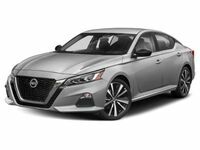 Both the 2019 Nissan Altima and 2019 Toyota Camry have an impressive list of engine options, technology features, comfort options, and safety features so, your decision as to which one is right for you can be tricky. Right from the start, the 2019 Nissan Altima has an advantage over the 2019 Toyota Camry in this comparison by having a much lower price tag. One of the biggest differences between the 2019 Nissan Altima and 2019 Toyota Camry is the availability of all-wheel-drive. The new 2019 Nissan Altima offers this traction control system whereas the 2019 Toyota Camry does not. If you desire increased performance and control on the road, the 2019 Nissan Altima with all-wheel-drive is a perfect choice. To learn more about the differences between the 2019 Nissan Altima and 2019 Toyota Camry and how they compare to each other, stop by Charlie Clark Nissan in Brownsville, TX or give us a call. You can also schedule a test drive online and take the new 2019 Nissan Altima out for a drive to see how it feels on the road.